SOLD FIRST WEEK ON MARKET OVER ASKING PRICE WITH MULTIPLE OFFERS! RECORD BREAKING SALE! Highest sale ever in the Building for an #06 floorplan & 3rd Highest Sale in Building Ever! Rarely available 2 Bedroom + 2.5 Bathroom & Den floorplan in the most coveted front facing west corner location. 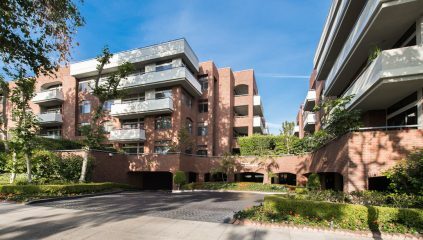 Treetop and city light views overlooking beautiful, lush landscaped Swall Drive. All rooms drenched in sunlight, huge living & dining room with a gas fireplace and den/media room that all open onto a terrace for entertaining. Generous master suite with walk-in closet, separate tub & shower & dual sinks. 2nd Bedroom on opposite side of condo for privacy. The kitchen features a breakfast area with large windows. A guest powder room and a private washer/dryer room complete this condo. The Building common areas have been recently been remodeled throughout including a re-furnished lobby and brand new hallways on each floor. Amenities include a 24-hour concierge, doorman & valet service, pool, spa, sauna, & gym. *Represented Buyer.